Wow I never knew that Gary has a birth defect or that James lost his middle finger. Hmm and my hubby is a huge Star Trek fan. I wonder if he even knows this lol. I knew James Doohan had lost a finger (one of those tidbits you randomly learn at some dinner party) but I had no idea how. To be shot six times? Holy bad aim! Also, I loved Sir Alec Guinness's quote at the end of the article. Made my day. Saw Ace of Cakes the other day where they made the Avenue Q cake, loved it!! Cool, cool, cool... and Holy Cow!?!? $400 and something for an old phone to plug your new phone into so it will function like the old ones??? Way back around 99' when my hubby and I were in college. He worked as a maintenance guy at a Holiday Inn for some extra money. With doing regular tinkering stuff, he ran the shuttle. There was going to be a wedding at the hotel and the bride's grandpa needed to be picked up. Jeff headed to the tiny airport. Can you guess who it was? Scotty! James Doohan in the flesh! His daughter had been talking to Jeff a bit after they arrived at the hotel and ended up inviting us both to the wedding the next day. Jeff and I couldn't make it due to work, but come on! How cool is it to go to Scotty's granddaughter's wedding?!? This has been just one out of many times that Jeff's rubbed elbows with the famous. Ha ha, I love you and your artful (or not) segues. You had me at "M*A*S*H."
Just when I think you couldn't get more awesome, you mention M*A*S*H as another favorite. Loved that quote from Alec Guinness. We just watched the first Star Wars again last night, and even if it makes NO SENSE for Obi Wan to be that old by the time Luke finds him, I'm always glad Guinness played him. I still remember from kindergarten or first grade being brought into the gym to listen to a puppet talk to us about Cerebral Palsy. Over two decades later I now learn there was a whole gang of puppets out there! I bow to your geek-cred. And I TOTALLY remember seeing KOTB in elementary school! Ack! Kids on the Block came to my elementary school every year! I loved it. Also, MASH is my favorite show of all time. I met Alan Alda once. Best.Day.EVER! OK, now you left us hanging and we have to know -- did you get the puppet or not? You have a photo of it, but the photo looks more like an online sales picture. My husband and I do puppeteering and we own our own puppets. They're simple half body ones from One Way Street but Jason and Emily are very cool. I've made puppets before as well, even though I estimated that there was 10 hours of labor in each one. The furry band looked great though, and our children's church puppet team still uses them today even though they are almost 20 years old. Actually, the booth wasn't selling the puppets. They were promoting the organization and the only puppet they actually had there was Jen's puppet. So, no. We do not currently own the puppet. Puppet. Did I miss the Cake Wrecks segue somehow? OMG! I did the Kids on the block when I was in middle school! I've never heard of other people doing it, but it's nice to know that you did and after reading the comments that it's still being preformed in schools! I swear Jen, you're really in my head sometimes. I was just talking to someone about Gary Burghoff's hand YESTERDAY. M*A*S*H, one of the best shows ever made. that's so neat that you had a puppet with spina bifida. one of my old friends from years ago had that as well. all of us girls loved to play with her crutches and scoot around in her wheel chair when she came over to play. There are a couple of Kids on the Block puppets at the Center for Puppetry Arts in Atlanta. I remember seeing one that was in a wheelchair and another wearing a helmet. There's also a bunch of other cool stuff there too--TONS of muppets, and they're working on an entire wing of nothing but Jim Henson's work. There's also puppets from Labyrinth, Fraggle Rock, and they have Big Bird!! Definitely worth the trip if you have the chance to go. Jen I don't even know you but I love you!! I feel we are friends. No, I am not some creepy stalker. I just follow your blogs and rarely make comments. Okay that sounds like a stalker. But I'm not. I just pretend we are friends...okay I am not making this any better. Me likey your blogs!! I didn't know about Doohan or Burghoff . . . wow . . . I've seen every episode of both shows so many times I can recite dialogue. I guess I'm not very observant. Next time I watch a Radar-era episode of M*A*S*H*, I will be looking a little more closely at that clipboard. It says a lot about his talent that he was cast in the movie and the show. They would never have let him in the army with a handicap like that, especially during the time of the Korean War. My daughter has a form of dwarfism, and the KoTB puppets used to make appearances at Little People of America conferences when she was young. The last time I remember them being out to any LPA events has to have been 15 years ago, so I thought they were defunct. Good to know they are still around. They had great messages for kids and adults alike. I met Jim Doohan at his ex-wife's house, and at said ex's wedding reception when she married my dad. I never noticed the missing finger, though I know I shook his hand. Go figure. KOTB came to my elementary school also! Can I say I LOVE YOU for saying "all get out" -- I am made fun of all the time for saying that! Did Kids on the Block put out a series of books? Because I think there was a series called that at my library, and all the kids had various disabilities: one girl had diabetes (she was also Greek, which I remember for some reason), another had epilepsy, another had asthma, one boy was blind...oh, and one had cerebal palsy. Those are the ones I remember. I can't seem to find those books in print anywhere. But they were GREAT. They had pages in the back with info about the specific disabilities. Good reading. 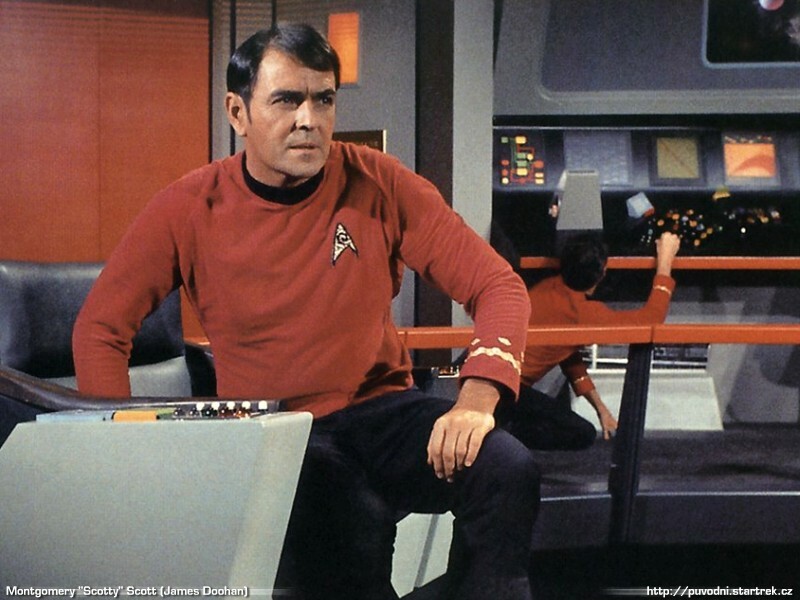 Item 1: I never knew about James Doohan's finger or Radar's hand! I'll have to watch for both now. Item final: Your seques rock. Silent film actors Buster Keaton and Harold Lloyd both had missing fingers (or parts of fingers) too. Buster Keaton was missing the end of his right index finger because it was caught in a clothes wringer when he was a little kid. Harold Lloyd's accident was considerably more serous. He was holding a prop bomb, and when it went off it proved to be not so... uh prop-ish. It took off his thumb and index finger, and for the rest of his film career he wore a glove with prosthetic fingers to hide it. Lloyd was the one who first did a scene where the guy hangs from the face of a huge clock above a city street, and Keaton was cited by Jackie Chan as being a major infuence on his comedy style. Coolness! I remember that they occasionally used prosthetic, finger extensions for Radar's hand. Most of the time his hand was just enough out of frame not to notice, or was holding something, or some sort of Hollywood trickery. I am clearly puzzled. I didn't catch a segue to Cake Wrecks or the quote by Sir Alec Guinness. Please point out both for me, as I obviously am oblivious tonight. After a picture of James I was all set for a picture of Gary and then there wasn't one! Story and thought: A good friend's mom worked for Mr. Doohan and his wife when my friend was young. She and her brothers often ended up at the Doohan home when there was a day off from school. Invariably the kind Mr. Doohan would take them all for ice cream and let them ask him about his hand. She said he was always excpetionally kind and generous. Regarding KOTB: I have to giggle thinking they may now have an autistic puppet. My son has autism and it makes me laugh to think there's some puppet out there who's continually ignoring you or lining up it's toys. WOW. KOTB can when I was in elementary school. I am an elementary school teacher and they came earlier this year to perform to for the students. Neat. Okay, so I love M*A*S*H. Love. I have every season on DVD, which doesn't matter, because I know every episode. Sometimes I recite the dialogue. I didn't think it was possible to give me trivia I did not know about. I had no idea about Radar's hand. The stupid part is I scanned two episodes yesterday to confirm this fact (season 2: Radar's Report and L.I.P. Local Indegenous Personnel). You can totally see it in both episodes. OMG! I remember the Kids on the Block. They came to our school and I distinctly remember the blind puppet with the braille watch. Neat. 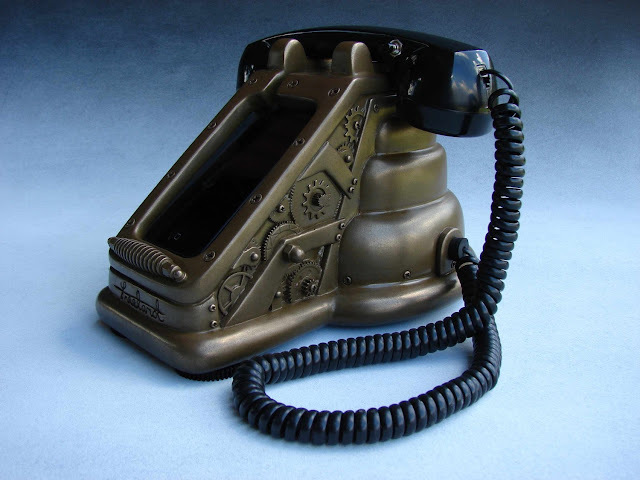 I'm disappointed that the phone itself isn't all steampunked out. I am 1st time long time of both of your blogs and I think you are awesome. The tone of your posts with all of their self-assured confidence--I really admire you for that. Thanks for always brightening my day with your wit. p.s.-If anyone is keeping score the posts in the category "nothing to see here" are the best EVER! My parents are M*A*S*H fans, so I knew the part about Gary's hand. Still, it's cool to know that OTHER people know!